I had the opportunity to try out Educational Insights Math Slam and we also are giving away a Math Slam to one lucky MomMomOnTheGo fan courtesy of Educational Insights. Math Slam features FIVE fun games that reinforce important math concepts such as sequencing, addition and subtraction facts, missing numbers, and triple addition and subtraction. 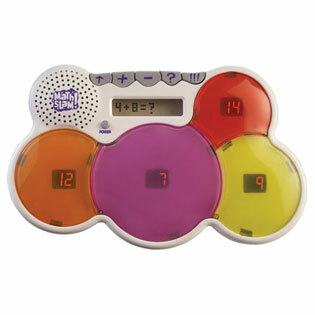 Math Slam is great for self-directed practice at school or home. *Automatically shuts down after 30 seconds of inactivity. The 5 Games are Slam It Up, Sum Slam, Subtraction Slam, Mystery Slam and Triple Slam. Slam it up is a number ordering game. Mystery Slam is Random addition equations with one addend missing and the answer showing. Triple Slam is Random addition and subtraction with one addend missing and the answer showing. Math Slam is rated for Ages 5 and up and for grades Kindergarten and up. We used our Math Slam and our 4 year old enjoys the game as well. With my assistance she was able to use the Math Slam and was Slamming It Up and doing Addition and Subtraction at 4. I truly love the Math Slam and think it is an awesome, fun resource for helping children get excited about Math. Courtesy of Educational Insights one lucky MomMomOnTheGo fan will be the lucky winner of a Math Slam. The contest is open to residents of Canada & the USA that are 18 years of age or older. If you are under the age of 18 then please ask your parent or guardian to enter for you. The contest closes on September 17th, 2011 at 9:00pm Pacific Time. The winner will be randomly drawn by “And The Winner Is” and contacted by email. In order for the winner to claim the prize, they will be required to respond within 24 hours of the sent time on the winning email. If a response is not received in time, then that person will be disqualified and a new winner will be drawn. The same rules apply for re-draws. If you want to ensure that you receive emails from me then please add my email address to your safe senders list. 1. Visit Educational Insights and then come back and leave me a comment as to what item you would like me to review. 4. Share the contest on Facebook and/or Twitter. Share as much as you like but you can only come back and leave one separate daily comment to count as an entry. Please remember to come back and leave separate comments for each entry as the program that randomly picks a winner does so from each comment and cannot recognize the content within the comment. The contest is for one Math Slam. There is not an option to exchange the Math Slam, receive a store credit or take cash instead of the Math Slam. Please only enter if you wish to win the Math Slam. A huge fan of MomMomOnTheGo!!! Would Love to review the BLURT Game we love games in our house and that certainly looks liek alot of fun! Liked Educational Insights on Facebook. I “like” MomMomOnTheGo on Facebook. I shared the contest on Facebook and Twitter. Would love to see design and drill! liked mom on the go and educational insights on fb! I would to see a review of Fraction Formula game. I posted this but I don’t see it???? So I’ll post again. I would LOVE to see a review on: GeoSafari® Omega Reflector Telescope! Fan of Educational Insights already! I have ‘share’d this contest on Facebook. I already ‘like’ MomMomOnTheGo on Facebook. I ‘like’d Educational Insights on Facebook. I “liked” the website on facebook. I would like to review Hot Dots® Reading Comprehension Cards. I’d love to know more about the Sneaky Squirrel game! I would like to see Mr. Scrambles reviewed. Thanks! I like MomMomOnTheGo on Facebook. I still would really love you to review the play Mixer on Educational Insight’s website. Every little girl would want one! I’d like to see FunThinkers® Match-Frame and Tiles reviewed. Hi – I would like you to review the Geosafari® Sonic Sleuth from the Educational website.